Listen in as Alex discusses the major reasons why Christianity began to shift its thinking towards Greek philosophy and how important it is that we be informed about this great shift. Brian Kelly has been studying the Bible for over three decades and leads a home fellowship in Syracuse, NY. 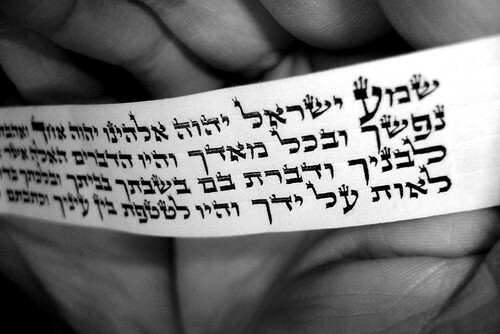 On this show he talks about the importance of the core creed of the Bible: the Shema. The word “Shema” means “Hear” or “Listen up” and it is the shorthand way of referring to Deuteronomy 6.4-5. 4 “Hear, O Israel! The LORD is our God, the LORD is one! 5 “You shall love the LORD your God with all your heart and with all your soul and with all your might. When a Jewish scribe asked Jesus what the foremost commandment was, Jesus immediately quoted this text. This tells us that the God Jesus worshiped is the same as the God of Moses and the Old Testament. In this show, Brian leads us to consider the two parts to the Shema. (1) To recognize that Yahweh alone is our single God (2) to love this God with everything (holding nothing back). Download this file to learn more about biblical monotheism and how to avoid the pitfalls of ancient Israel’s idolatry. Dr. Joe Martin earned his MA in sociology from Arizona State University, a second MA in Theology from Fuller Theological Seminary, and his doctorate from Columbia Theological Seminary. He is the academic dean of the Atlanta Bible College and has been professor of Old Testament for almost twenty years. The subject focused on the resurrection of Jesus as well as the coming resurrection of the people of God. Dr. Martin explains the Old Testament underpinnings of the idea of resurrection and demonstrates conclusively that the biblical idea is incompatible with the pagan notion of the immortal soul. By comparing Jesus’ death with that of Socrates, we are able to see that, for Christians, death is not a friend to be greeted with kindness, but the bitterest of enemies. Furthermore, Dr. Martin points out that a good deal of modern scholarship is moving in this direction, which means that people are coming to understand with more clarity that God is not planning on destroying the earth, rather his goal is to redeem it at the return of Christ. Therefore, as Christians, believers in the resurrection of Jesus and the future resurrection of the righteous, what sort of people are we to be? You are currently browsing the Truth Matters blog archives for May, 2009.